Description: A specially formulated product for contract use. A powerful rapid action cuts through dirt and grime and it has a controlled foam so there is no excess foam to rinse away. 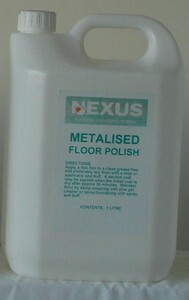 Description: A metallised polish for extreme strength and durability coupled with ease of removal. Non yellowing polymer film produces an excellent shine with excellent slip resistence. For all linoleum, PVC, rubber, sealed cork, sealed wood, terrazzo and thermoplastic floors. Not suitable for unsealed wood or cork. Directions: Apply on a clean grease free floor any old polish should have been stripped using polish stripper (TC020) then rinse thoroughly with clean water. Apply a thin even film of polish using a clean lint free mop or applicator. Apply a secon coat when the first is dry (approx 30 minutes). Polish may be buffed to improve the gloss. Available in 1 and 5 litre plastic containers. Coverage is 60 square meters per litre. Maintain using spray and buff floor maintainer TC022. 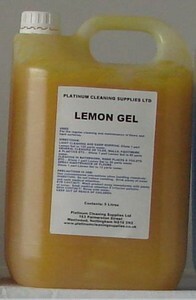 Description: A highly alkaline solution for quick removal of all emulsion and metallised polishes. Controlled foam for use with machines. This is also available as an ammoniated product for unlocking aged on polishes and to remove dirt and wax. Description: There is a range of hard surface cleaners depending on the soil to be removed. The picture shows three of these. The caustic based hard surface cleaner is best suited for the removal of animal fats from all surfaces, the metso based one will remove general soilage from most surfaces and the d'limonene based one is best for removal of oils and grease in all applications. The use directions vary depending on the product used and the severity of the soilage please see safety data sheets for details. 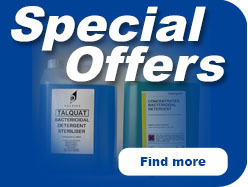 All these products are available in 1, 5, 25 and 200 litre plastic containers. 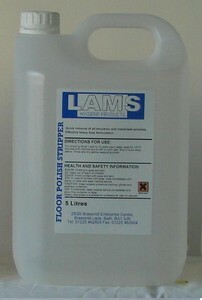 Description: Concentrated product with fresh pine or lemon fragrance and is an ideal mopping solution for all surfaces. Will not remove polish, but can be rebuffed and is slip resistent. As well as polished floor maintenance these products are ideal for spray cleaning for dirt and heel mark removal. Directions: For general mopping dilute 1 part to 160 parts hot water. Mop allow to dry and buff if required to improve the shine. For spray burnishing dilute 1 part to 80 parts water. Spray lightly ahead of machine fitted with nylon pad and immediately polish to a shine. Nb for maximum floor life we recommend that floors are sealed with metallised floor polish (TC019) and regularly maintained with spray and buff (TC024). 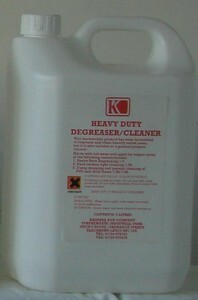 Product available in 5 litre plastic containers.